I first saw THE RED HOUSE by accident. Way back when there were only VHS tapes and not DVD Bluray or digital down loads I would travel the length and breadth of Long Island to find the movies I was looking for. One day I was in some mom and pop store miles from home I rented a stack of films and one of them was not supposed to be The Red House. Unwilling to schlep back to the store for one film I sucked it up and watched it. Not surprisingly I enjoyed it, so much so that I’ve seen it a couple of time in the almost 30 years since I saw it and certain shots remain burned in my brain. The plot is potboiler having Edward G Robinson and his sister raising his adopted daughter far from the neighboring town. While there is nothing outwardly wrong, they are still cautious especially about the red house located deep in the woods which they try to keep away from prying eyes. 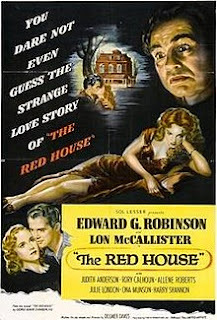 When the red house is discovered by the daughter’s beau, and curiosity gets the better of everyone, the sins of the past appear to be close to being discovered. Actually selling it as just a potboiler is wrong since this is really a film noir dressed up as gothic potboiler. All the tropes are here with crimes gone wrong, karma coming back to get the hero and all the arty darkness. It’s a sordid little tale and you may want to take a bath afterward. I really like the film a great deal and as I said at the top this is a film I return to time and again. Highly recommended- more so since the film is playing on the big screen at the New York Film Festival Saturday where its dark goodness will get a screening worthy of a survivor of 70 years.